When someone asks “what the largest country in the world?”, how would you answer? Should you pick the country with the most land mass or the one with the most people? It can be a confusing topic, so today’s post is going to cover the answer to both. First, we’ll cover the largest country by area and give a few interesting facts about it, and then we’ll move on to the country with the largest population. Before we begin, what are your guesses for each? Keep reading to see if you’re right. If you guessed Russia, you were correct. According to WorldAtlas.com, Russia is the largest country on Earth by far. At 17,098,242 square kilometers or roughly 6,601,668 square miles, Russia is nearly double the size of the second- and third-largest populated countries on the list. Canada holds second place at 9,984,670 square kilometers or 3,855,103 square miles, and the United States is a close third at 9,826,675 square kilometers, which is about 3,794,100 square miles. 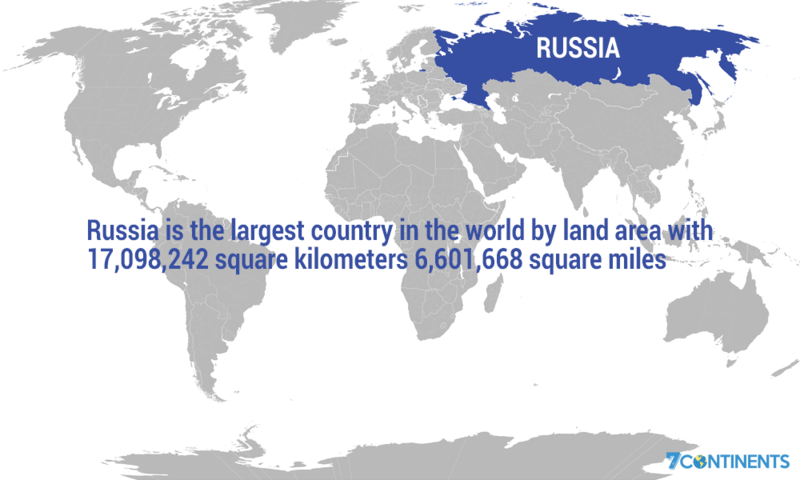 In fact, Russia is so large that even if you were to slice off 7 million square kilometers, it would still hold the top spot on the list, and that giant chunk you chopped off would be almost as big as Australia. Did you know that, because of its size, Russia borders 14 different countries? It also spans 11 time zones and two continents: Europe and Asia. 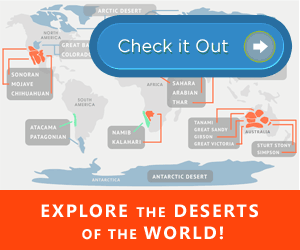 In addition, there are also beaches on the coasts of three of the four major oceans: the Atlantic Ocean, Pacific Ocean, and the Arctic Ocean. Russia contains both of Europe’s largest lakes by size with the Onega and Ladoga. You can also find the largest lake by volume in Russia as well: Lake Baikal contains more water than any other lake on Earth. In addition to all of these amazing features, northern Russia also boasts the world’s largest biome apart from the oceans: the Taiga, or “boreal forest.” This is a dense forest filled with pine trees that stretches across all of northern Russia and extends all the way to Eastern Canada. The title of “most populous country in the world” is held by China. Currently, China, located on the Asia Continent, is home to 1,415,045,928 people, or approximately 1.4 billion people, according to the most recent United Nations estimates. This works out to be almost 20 percent of the world’s entire population all squeezed into a country that is slightly smaller than the United States. To help put this into perspective, the United States is the third most populated country, and it only holds 327,417,191 people, which is roughly 3.3 million. Russia is more than twice as large as China, but it is only home to about 1.4 million people. 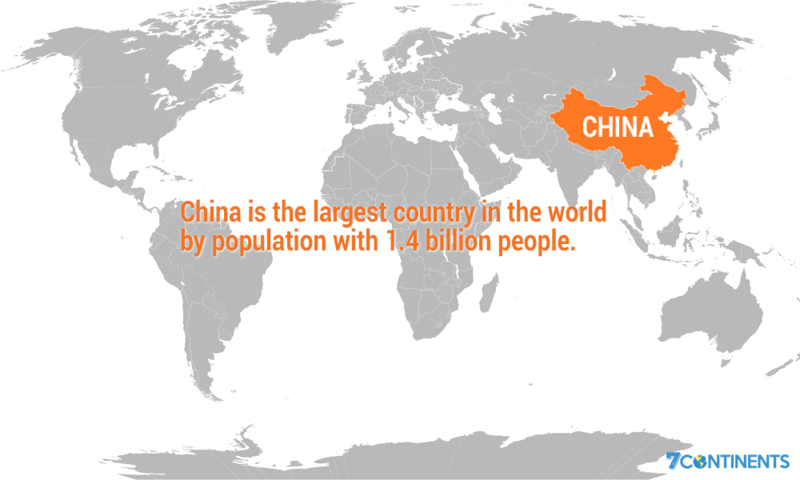 The only country that even comes close to China in terms of population is the country of India with about 1.2 billion people. This map by AmazingMaps shows just how many people live in China compared to the rest of the world. 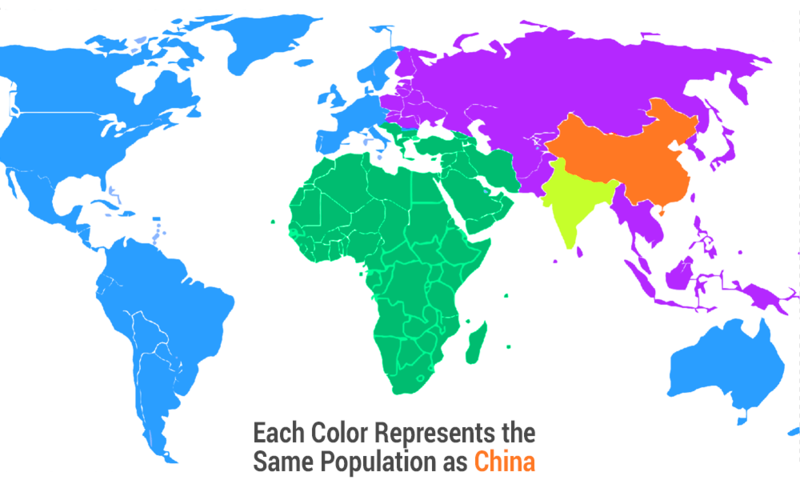 The map is divided into five regions with each color representing the same population as China. Throughout the years, China has regarded its massive population as both a positive and a negative, depending on the historical context. Right now, China is in a bit of trouble because of its population breakdown. Because of the long-standing one-child policy that has only recently been relaxed, there is a huge imbalance of boys to girls, which makes marriage and balancing out the population more difficult. It also means that the average age of a person in China is steadily rising because there aren’t enough children being born to replace the aging generations. To give you a better idea of what the male-to-female and age ratios look like, check out this population pyramid graph from World Population Review. Now when someone asks you about the largest country in the world, you can be more specific about your answer. You not only know which country is the most populous, but you can also point out which country is the largest by land area too. Both Russia and China have impressive claims to fame, and the facts you read here only scratch the surface of just how noteworthy these countries truly are.